It’s the advertiser’s weapon of choice in 2016 – and for good reason. When compared to outbound or traditional marketing, content marketing trumps on nearly all fronts. First, content marketing is preferred by marketers around the globe at a ratio of 3 to 1. Why? Because, largely, consumers have become sick of, and even impervious to, outbound efforts – cold calls, junk mail and email, printed ads in magazines and newspapers (do people still even read those? ), TV and radio commercials, posters, flyers and even paid-for in-yer-face pop-up ads on websites. In short, consumers don’t like advertisements shoved down their throats. No, in 2016, we are firmly within the era of the empowered consumer, which means that your potential customers no longer want to be barraged with unsolicited information. They don’t even want to pick up the phone to talk to a sales associate. No – if they want to find out about something, they’ll head online and do so themselves, thank you very much. As such, it should be no surprise that content marketing works. Here’s another stat for you – 61% of consumers say they are influenced by custom content. That’s a serious amount. But all of that wouldn’t even be a consideration for firms if the ROI of content marketing didn’t surpass that of traditional outbound. Furthermore, adopters of content marketing can expect 6 times more conversions than non-adopters. Got the message? Content marketing is your success story waiting to happen. It’s a good question. And I want to give a good, simple and concise answer. I like the definition – it explains the purpose of the concept. But perhaps it doesn’t get to the crux of the matter, which I believe to be in the understanding what “content” actually is. I have a sneaky suspicion that many people – and especially those not involved in the marketing industry – believe that “content” is all about blogs. 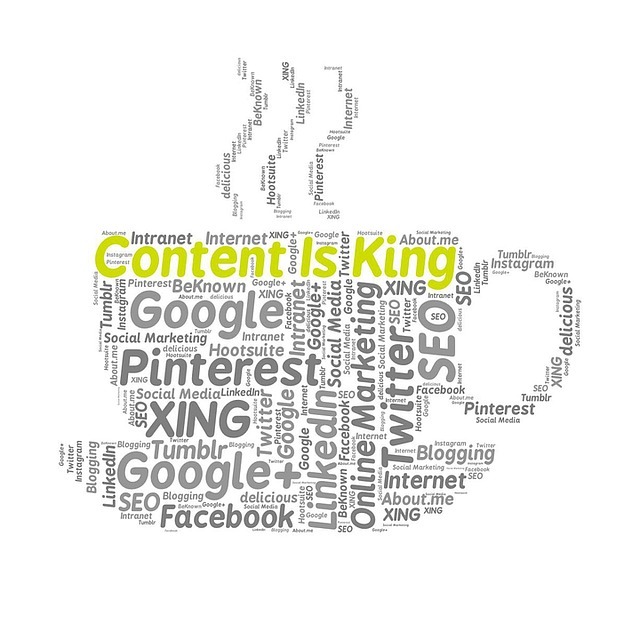 Content is about blogging – and, to be fair, that does make up a significant amount of it. But content is so much more than your weekly blog post. No, content is every single piece of information that you create for free consumption online. Those are just off the top of my head, but there are doubtless others. I’m writing this post because, from my own experience, I know that many SMEs seem to think that they are doing content marketing by simply putting up a new blog post once a fortnight. Of course, they are embarking on content marketing – but only by half (at best). And so I want to explicate the benefits of taking a more holistic approach to content marketing – for much improved results are readily available for those that go beyond the blog. Ok, ok – I’m aware of the irony here. First of all, this is a blog post. And second that I’m putting blogging at the top of my list of content marketing material that’s supposed to go ‘beyond the blog’. BUT, I do so because your blog will always form the cornerstone of all of your content marketing efforts. And (sorry) I’ve got another stat to prove it – 82% of marketers who blog see positive ROI from their inbound marketing. Frankly, the remaining 18% must be doing it wrong. No matter what other content marketing materials you start creating on the rest of this list, your blog will be the backbone that supports it all. The reason is simple – with blogs, you are delivering in plain English (other languages are available) the full, no-holds-barred, nitty-gritty on all information that you provide on other channels. Your infographic will deliver the facts, but your blog will explain why they’re important. A 30-second video will hold up your message, but your blog will hammer it home. Blogs are therefore perhaps the most important facet of your content marketing efforts – but in combination with your other output, the value of your blog will increase tenfold. Are you using video as part of your content strategy? You bloody well should be. You might be aware of our ‘Digital Marketing Weekly Roundup’ series (what d’you mean you’re not?!?!) that we produce every week. Well, if you are, then you will be aware that your favourite social networks – Facebook, Twitter, Pinterest, LinkedIn – are increasingly improving their platforms to make them more and more accommodating to the production and promotion of videos for marketers. Do I really need to go on? Lights, camera, get your butts into action and start introducing video into your content output!! If you’ve got a data story to tell, then your prologue should be written in an infographic. Data stories are used to promote the quantifiable beneficial elements that will persuade someone that employing your services is a valuable proposition. Let’s say you’re selling subscriptions to video-making software. See those stats above? Social video generates 1200% more shares, etc.? That is HUGELY valuable information that your potential clients need to know. But, buried away in a blog post somewhere it’s likely to be missed by a significant percentage of would-be potential clients. Produce an infographic where this hard-hitting info can be consumed and digested at a glance – and then in your blog you can drill down into the finer details of the associated benefits. Content marketers know that written content is valuable to their own promotion. I know this because they all blog – but a significant few overlook the value of other written content. Whitepapers are an exceptionally important element in content marketing. Here is where you will be delivering in thorough, highly-detailed terms the value proposition of your product. Indeed, your whitepaper (or whitepapers) should be your manifesto – this is what we do, this is why it works, and this is why your company will benefit from our services. This type of in-depth, thoroughly researched information is not deliverable in one blog post – for that is not the purpose of blog posts. Blog posts are normally short(ish). Up to 2,000 words, but generally between 800 and 1,000. Your whitepaper, on the other hand, can and should really run into the higher thousands, explaining in detail exactly what the problem is your business is trying to solve, how you solve it, why your solution works, and why anyone would simply be a fool not to hire you. eBooks, by contrast, are not so inwardly focussed. They take into account your industry in a wider context, and deliver valuable insight into the state of things and things to come. You will offer them in exchange for an email address, which will then give you yet a further channel to deliver more content. In both cases, however, it will naturally be your blog that you use to promote this content. So make sure that you do so, and use it to create teasers that will entice downloads from leads who are interested to learn more about what you do and where you sit in the industry. Need a content marketing solution that covers all bases from blogs to eBooks? We’ve got what you’re looking for. Here at My Social Agency we are expert content marketers that can deliver on every level. Check out our Content Marketing Services Page to see what we offer, and please use our Contact Page to reach out and start a conversation that will launch your business to the next level.